By LUDWIG VON KOOPA - Very transparent grabs at your money that come off as odd. Ever play a recent videogame that has downloadable content (DLC) and just feel like it's...really pushing you to buy it? Something seems really different about the part of the game where the DLC store or content lies, like you're in another realm and it breaks your suspension of disbelief. 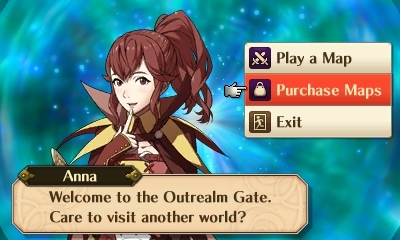 And in some games, like Fire Emblem: Awakening, it really IS just a warp to another realm just sitting in plain sight. Um... not really. Perhaps the YoshiRider123 that used to be our friend swapped places with this jerk robot Chrom guy through the Outrealm Gate? We generally don't like this corporate money-snatching intrusion into our in-game world, but that doesn't necessarily mean we want it in our menus. After all, that can go horribly, horribly wrong just as much, if not worse. Let's discuss. The main example I want to use here, the thing that inspired me to even write on this is Pokémon Mystery Dungeon: Gates to Infinity. Specifically, Foongus. Foongus exists on the outskirts of Post Town, next to The Traveling Sales-mon and Cofagrigus's Glorious Gold. The Traveling Sales-mon changes frequently and is generally generic and unhelpful, but Cofagrigus is one of my favourite characters in the game. His mugshots are amazing and exaggerated and his speech patterns are endearing. He also offers some helpful things. Pretty fantastic guy. So next to this awesome Cofagrigus there is Foongus. While Cofagrigus and every other NPC in Post Town react to what's going in the story with every plot advancement (different dialogue if you talk to them, so you'll want to talk to everyone in town every time the story moves along), Foongus is static. This is all Foongus says, not even caring that the world is going to end. Does this make Foongus an admirable, dedicated capitalist that is focused on making a profit regardless of circumstances? No, it makes him boring and intrusive. He only has one mugshot sprite, ever. A capitalist would at least vary his or her marketing if it's not working, but Foongus really doesn't care if his downloadable content sells or not. He's just peddle it if you go talk to him. The only even somewhat interesting thing is that he's sitting on his platform instead of behind it 'cause he's short. Basically, he's the least interesting NPC in the whole game, which is saying things because I really didn't care about the characters in Pokémon Mystery Dungeon: Gates to Infinity as I played it through. Which is totally different than the previous games in the series. 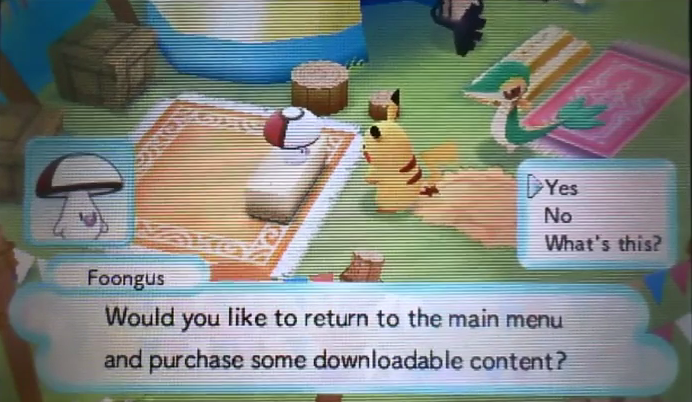 I hope Pokémon Super Mystery Dungeon is much better in that. But I digress. If I wanted to have DLC sell, I'd make the in-game sales guy the most interesting character in the game. And you would be rewarded for your purchases by additional and unique dialogue from the character. Right now I just want to let Foongus sit in his misery. You think it's a coincidence they picked Foongus? Is it the mushroom thing or the Poké Ball thing? Perhaps the act of actually leaving the game (and breaking the fourth wall in the process) is Foongus using Spore and getting you on some shrooms. Not the focus of this article but also an interesting, related topic of discussion: How the amiibo are treated in Splatoon. Basically your amiibo comes to life trapped in this glass cage. They all have unique personalities depending on the amiibo and give different content, though it's disc-locked content and not downloadable content. I mean, the acronym is still DLC, but whatever. Dr. Beakon is an original character of the Miiverse user Mostafa. The amiibo part of Inkopolis is also on the outskirts of the city. You can't even quick-jump to it like you can every other accessible feature in Booyah Base. You have to sorta go out of your way to it, so it's not really that intrusive. But it's still out of place. They aren't dynamic like the other NPCs in the game are. 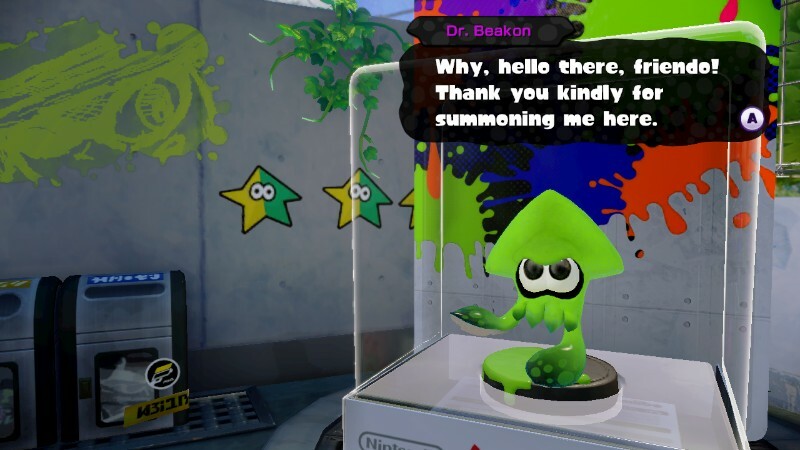 Though I guess they don't have to feel a part of the game world since they're only there if you summon them. But there's no in-game explanation for why it's ethical or how it's possible to summon Inklings in this glass cage as other Inklings just look on. Meanwhile, everything else in the Splatoon game world at least follows the game logic. Ludwig doesn't totally like this idea of pervasive DLC, but if it's going to happen, he would like it done right. He hasn't bought DLC for Pokémon Mystery Dungeon: Gates to Infinity or Fire Emblem: Awakening, and never will. Maybe make the shopkeeper be someone from a distant land who only takes a certain currency (and it is real life currency) and will give you items that is in game not carried by regular merchants such as weapon unlocks or if it is a new map it can be ingame referred to as a plots of land you buy? For characters you can consider it like you are hiring mercenaries? A quick announcement for new content like what is done in SSB4 when the game is opened is okay for me. Oh yeah and I never got Gates to Infinity. How dare they leave out Girafarig? At least Pokemon Super Mystery Dungeon will once again include the giraffe Pokemon. I'm fine with how SSB4 advertises their DLC. Especially with the in-game-created screenshots. That actually adds value to everyone and is relatively enticing. Unlike the static, value-less Foongus. Weird shopkeepers from a distant land is so cliché. And back in my day when that happened and they wanted a certain currency, that was an in-game currency you had to go on sidequests to get. Don't bother getting Gates to Infinity. The only reason I got to play it is because Samantha Lienhard gave it to me for my birthday. Which was super-nice of her. D-Don't worry! I still appreciate you gave one! I think games with DLC/microtransactions should take a tip from Rusty's Real Deal Baseball. While I didn't care for the baseball stuff enough to actually buy anything, I did enjoy talking to the characters. Rusty trying to sell you things is a part of his personality, and since you can haggle with him, it feels more... real.